From what I remember of its arrival, River Island came at a time that Grafton St was beginning to look more like Oxford St and we were about to enter our teens so were blooming well excited about it. The style mecca that was St. Stephen’s Green Shopping Centre had opened a few years previous and all of our hands were donned with ‘silver’ mood rings from Asha and bums clad in jeans from Motion Picture so we were already fancying the cut of our own jibs. We had an appetite for ‘trendy’ and were fascinated with this ‘high street’ which we read so much about. These stores, that were ever-present on the pages of Just 17, that we had seen in all their wonderful glory on a visit to the English cousins, were now actually going to be part of our sartorial landscape. Even the Dice Man couldn’t distract from these developments. The anticipation was palpable. If I remember correctly, River Island moved in to the Arnotts building on Grafton St. I have hazy memories of a cafe in the now men’s section of the store. Long before the cafe boom on nearby streets I guess. I feel like River Island was just a section of the store at first, a ‘cool’ area at the back of upstairs although it’s highly likely that this is a blur of recollection, most likely brought on by the said frenzy of UK brand overload. And so it was that River Island became a staple in the Irish ‘high street’. 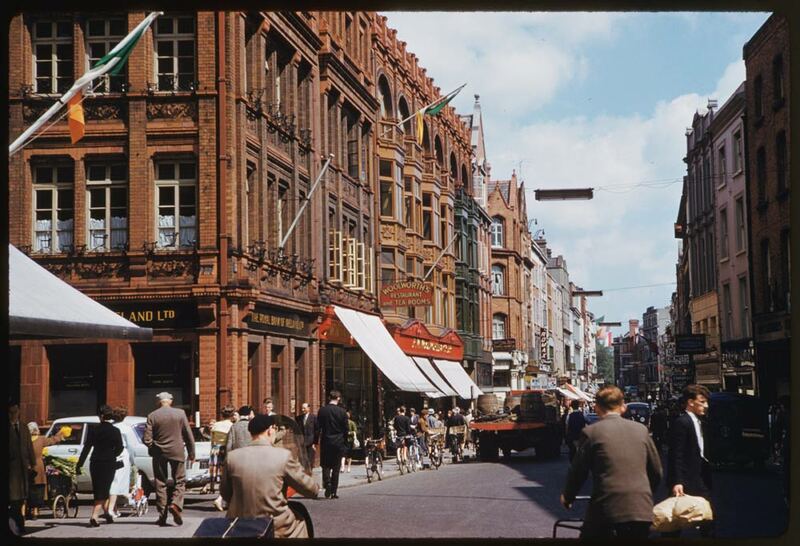 Grafton Street’s store seemed to grow inexplicably, sister branches made their mark on various counties shopping strips and every student worth her salt was saving for a pair of their covetable shoes. Perhaps it was because of my interest in Vintage growing along with my height but these stores became somehow less relevant to me. When I finally began to take notice again after a few years of auto-pilot independent shopping, I found River Island to be a sea of glitzy tiny dresses and over-sized gold buckles. ‘When did this happen?’ I thought. Was it always like this, or was it me who had changed? Well of course the latter was definitely true and the former… well, it’s hard to say. Did the ever present bling mean I was too old to shop here anyway? That would be a harsh reality. I secretly polled my friends to see where they found themselves shopping in those days that saw their first digit move from a double to a triple. ‘River Island for jeans, aaaaalways.’ was the immediate definitive answer of one such friend. ‘River Island, you say’? Well perhaps it was time for another little look-see. And so for the past while I have kept much more of an open mind and such willingness has been rewarded. I have found shoes that give me happy feet, tights that make my legs feel individual and scarves that suit every mood. A midi-skirt is beautiful and a staple. I am particularly enamored with their bags of late, although have had to overlook a couple of beuts when the ‘River Island’ logo has presented itself too prominently. Not quite the gold medallions you understand but after years of my Papa telling me brands should be paying us to wear their logo instead of the other way around, I find that I identify more with the view of the old cynic to that of the exasperated adolescent. Most recently I have had more reason to visit the Island through my work as a stylist as I take on more projects in contemporary fashion. The experience has again been rewarding. I have had time to peruse the rails, consider the collection and ultimately find gems for my work and indeed myself. It’s a revelation. At a time when my 13 year old self would have considered me pathetic for frequenting her stomping ground, I find myself once again excited by the brand. My nostalgic little heart was brimming as I spent time getting to know this particular range. There was the Senna blue top and Senna blue shorts both with large white polkas that were very Gidget-esque, as were a couple of the ‘bikinis’ – those with high waists that allow you to eat plenty of the local food whilst still looking fabulous – my kind of swimwear. Then there was the Wysteria crop top with matching skirt; ok, less local food allowance with this one but the Flossie sundress is a great alternative should you wish to avoid the midriff baring. My favourite items came in the form of the Suzy chiffon shirt, a white beauty with sheer panelling and understated attitude, and an over-sized floral jacket that screams happy! I picture myself walking the streets of NY during my pending March visit, dressed for whatever the weather in this perfect outerwear dream that allows for lots of outfit variations underneath and suits all certain activities: the browsing; the sightseeing; the cocktails; the taxi queues; the markets; the brunches. It’s just so right. The moral of this story? Before resigning an establishment to the ‘under-age’ department of your shopping mind file, first check if any of your older friends are still shopping there. Then revisit. The second moral? Don’t judge a brand on it’s window bling.